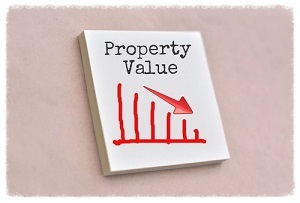 Average residential property values are dropping in Auckland but rising elsewhere, according to the latest figures from Quotable Value (QV). QV says the average value of homes in Auckland dropped from $933,264 in December to $928,921 in January, a decline of $4,343 or 0.5%. Average values fell particularly sharply in coastal suburbs of the North Shore, dropping from $1,244,765 in December to $1,225,307 in January, a decline of nearly $20,000 in a month. For the whole of the North Shore average residential property values dropped form $1,089,745 in December to $1,079,445 in January. Values also declined in the central isthmus district (suburbs within the boundaries of the former Auckland City Council) where the average value of homes dropped from $1,095,838 in December to $1,092,459 in January. In Waitakere average values dropped from $748,011 in December to $736,745 in January and in Manukau they dropped from $796,027 in December to $792,505 in January. However average values continued to rise in Rodney, up from $815,353 in December to $820,973 in January, and in Papakura where they rose from $601,717 in December to $607,837 in January, and in Franklin where they were up from $580,110 in December to $584,173 in January. QV national spokesperson Andrea Rush said it was the first time in more than a year that average housing values had decreased in the central Auckland suburbs of the former Auckland City Council. "The value decreases in parts of Auckland could be in part due to the seasonal impact of the holiday period and the housing market may pick up in the usually busiest months of the year, February and March," she said. "However it is more likely to be a continuation of softening in the market we saw following the introduction of new rules by the government and the Reserve Bank to curb investor activity in Auckland and the restrictions on the flow of capital out of China that occurred late last year." QV Homevalue registered valuer James Wilson said although the Auckland market had softened, there was still good demand for new homes. "January has seen a continuation of the softening market conditions prevalent in the latter months of 2015, characterised by decreased activity and an easing of some Auckland sub-markets, particularly investor housing stock," he said. "However, demand for recently constructed dwellings or purchases off-the-plan is still extremely strong particularly for developments which offer smaller layouts such as attached townhouses or apartments as they offer more affordable options for buyers." However average values were continuing to rise in other main centres, with the average value of homes in the Wellington region increasing from $476,634 in December to $482,716 in January, while in Christchurch the average value of homes rose slightly from $482.043 in December to $484,118 in January. In Hamilton the average value of homes rose from $444,211 in December to $447,921 in January and in Tauranga the average value of homes rose from $541,881 in December to $557,313 in January. There was also a big jump in average property values in the Queenstown/Lakes district, where they increased from $776,671 in December to $790,112 in January. In Dunedin they rose from $308,944 in December to $310,887 in January. Rush said Wellington values were increasing at their fastest pace since prior to the previous peak in 2007 and there was good optimism in the Christchurch and Dunedin markets. The 'Index' chart will be drawn here. The '% change year on year' chart will be drawn here. Let's hope the cancer spreading to the rest of the country helps with the mood for a change of government next year and the door is slammed shut. No hope needed. It will happen. The auckland market is the best in the world for investors, and the chinese will figure out the documentation requirements. The documentation isn't the hard part, getting the money out of the China is the part that is getting increasingly difficult. As China weakens the Yuan, it's buying power will decrease and capital controls will continue to tighten. However, I get the feeling you're not looking for any alternative viewpoints as your mind is made up on Auckland property. You'd hardly have to be a financial genius to be engaged in that kind of low level law breaking. "Some Shanghai banks have recently asked their outlets to closely check whether individuals sent money abroad by breaking up foreign-currency purchases into smaller transactions and to take punitive action if violations were discovered"
At least it is starting to reflect what people has been saying for a few months now and consistent with what is being seem in Vancouver, London,Hong Kong and the US.Appears to be a lot less demand for $2m and above at the moment. With the dairy boys suffering the banks are going to have to be a lot more cautious with mortgages or else they will get double whammied on Agriculture and Auckland property. Auckland,we'll take it from here thanks. C'mon Greg, how about putting these "stats" into some sort of perspective. 1. Does this Dec-Jan slight dip occur in other years, too? The graph with the QV House Price Index (thanks for this) suggests that a similar dip happened a year ago and also two years ago. 2. Is it meaningful to even compare the January sales results with those from the previous month in December? QV spokesperson Andrea Rush provides the clue: "the seasonal impact of the holiday period". Who would'a thought? 3. How do results from Jan 2016 compare with those from Jan 2015 or Jan 2014? But good for you, you got me with the clickbait headline "Average house values drop in Auckland, with houses in coastal suburbs of the North Shore leading the fall". Even though I knew there would be no facts or evidence to back up the headline -- although reading that coastal North Shore properties have plummeted in value by $20K in one month made me giggle when I imagined how much this would be if it goes on like that for a whole year -- I clicked on it, nevertheless. Could you please stop trolling and let the adults have a conversation? We read what we want to read and believe what we want to believe. In response to your first question. So, no - there was no dip a year ago but a strong increase. It's usually sales that get affected as a direct result of the summer break, not prices. It will be interesting to see the REINZ stats tomorrow, if Auckland comes in around 760,000 then I am confident in stating that Auckland prices began to plateau in the final months of last year and are continuing to do so. The rest of the year is anyone's guess. Translation: "My financial future is entirely dependent on house prices increasing, so no way I'm going to believe anything negative about house prices!" Quite, Auckland is cheap as chips . Just wait, the average house price in auckland seems to trail behind Vancouver but you can easily see it getting to 2.8 million dollars for the average detached house. Who would have thought that the path of nz's monetary policy would be dictated by housing speculators rather than exporters/manufacturers. It can only be because Key/English desperately want o/seas spec money coming in to try to create their much vaunted surplus ! O/sea's money needs high interest rates and stability of the OCR. The RBNZ in providing this scenario thus seems to be doing Key/English's bidding. Could governor Wheeler be in Key/English's pocket? central banks tend to follow markets and not the other way around.
' tend to ' are off the table. The IMF have now warned again over the NZ housing market. If prices do continue to rise then the Govt. almost certainly will introduce a wealth tax on property owned by overseas individuals/entities in the same way they have in London. The days of rampant property rises is almost certainly over. My personal view is that they are likely to correct. The world is getting more uncertain by the day at the moment so doesn't seem the time to be leveraging up. No it's not. Ron Fong Choy has stated that the market is about to go bananas. He knows plenty of Chinese and Indians. Yes stop trolling you dxxk head! BUT UN ZUL'N USS DUFF'RUNT!!! AKL is part of the international property market and there is definitely a change in sentiment. Make of it what you like. As house prices ease rents will rise. Potential buyers will tend to hold off buying and remain renting if they perceive the market is falling. Higher rents will never compensate for a significant drop in house prices. Trade Me Auckland added today. 93 for rent, 57 for sale. I think the opposite may happen. Also check the for sales, most of them empty, have been staged. Tell tale signs, 20 cushions per bed, fluffy rug on carpet, overly colorful paintings, plates on tables, etcetera. IMHO I think i think prices will just stagnate this year - won't drop much more, won't rise much either. Not brilliant news for highly interested people (either way) but good for long term owner occupiers I guess. If property prices stagnate then there is obviously no capital gains to be made. This will mean no investor/speculator demand this will reduce overall demand significantly. Surely this will lead to a continued fall in house prices. For how long will people hold onto property which is highly leveraged where the rent isn't covering even the interest let alone rates and insurance and r+m? So where from here for Hamilton and Tauranga???? Yeah because the property market is so powerful it's just unstoppable. Or is it all just a fantasy, time will tell. Many believe in dreams and get rich quick schemes. Someone was recently bragging to me about how great Hamilton was, because in Auckland a rental will cost you an extra $500pw but in Hamilton it will only cost you an extra $100pw. Smart man. Tauranga is a great destination for cashed up Auckland baby boomers. When it rains, it does so at night. The place has great volcanic soil which can grow anything. Good access to hospitals, parks, cafes, shopping centres. Tauranga also has a port which, unlike the port of Auckland, can grow. Tauranga has heavy industry around the port, and has rail access to Hamilton’s newly approved by the EPA inland port. Pretty much all of Tauranga is surrounded by beautiful coastline and there are some particularly beautiful north facing suburbs like Matua and some parts Cherrywood with views of Mt Maunganui. Those suburbs will become the St Heliers of Tauranga. Rental yields in Tauranga are pretty low so there’s lots of room for upwards price movement. Just my humble opinion. Probably best to wait for Auckland to drop significantly as investors will double back. The main problem with Hamilton and Tauranga, is that it will be difficult to increase rents beyond what the average person can afford so it isn't a sustainable market so you could fall in to a negative equity trap. Plus their house prices will drop once local investors double back to Auckland when the market becomes more settled. I feel Hamilton and Tauranga will probably do relatively better. AKL has priced itself out of the market for now. Why on earth do so many people rely on "values" to enhance their worth ? because with cheap credit it is all headed to asset prices so normal fundamentals are less observed. In a tulip mania the profit is so high that frankly if the interest on the borrowings was 3% or 7% they would still borrow when making 11%+. I think Hamilton will tank soon for a few reasons. Dairy is not looking good for a few years at least so this will affect other related industries. The amount of rentals available is far greater than the amount of houses for sale. What I think has happened is that since the 30% LVR came into effect in Auckland, companies like NZ Invest have been targeting Ma and Pa investors to get a rental property in Hamilton with just 10% down, using the existing equity in their Auckland house. It doesn't matter to them where Ma and Pa buy their house as still get commission on the re-mortgaging. What Ma and Pa forgot to factor in is, are a lot of people moving to Hamilton. Personally I don't think this is happening. With an excess supply of rental houses, Landlords will then have to drop their prices to get tenants in. This will naturally lead on to lower house prices in Hamilton. ...there are some god awful houses getting big money ....and these god awful houses will have god awful poor paying tenants. Factor in all the new suburbs both in Hamilton and the surrounds with the huge loss of dairy income ... which has yet to hit...and you may well be correct. But who knows huh? Zorro, i saw an open home where the door had to be shut after 30 minutes as too many people were inspecting the rental property, multiple offers given on the day, there is nothing decent to rent in Hamilton so if have a good looking property it is gone within an hour. Agreed BigDaddy as I have just put all my rents up by between $20 to $40 at about a 2 to 3.5% rental increase which seems fair to me to cover increased costs of insurance and rates. Even though my servicing costs have gone down due to low mortgage rates, I don't think that comes into the equation as I now have assets at 3-4% gross yield on sale price (down from 5-6% when originally purchased) plus its not like when mortgage rates were up at 10.5% that my rents went up 10.5% to compensate! Yeah and don't forget the whopping 33% Capital Gains Tax when you sell. And yes the government still havn't made it clear as to what happens after the two years of investor ownership, currently known as the 'bright line test'. Chances are they're propbly still want to charge the Captital Gains Tax to investors even after the two years. Nah that only applies to property purchased after October 2015. Step back, take a deep breath. And in percent terms a rough look at the numbers.. we are looking at less than 1%. Hey the market is going down big time extreme? So I think we should count to 10 veeerry slooowwly and panic in an orderly fashion. Yes lets hope that the dust has settled a bit more by the end of April to give us a clear picture on the state of the market. Remember a property is only worth what someone is willing to pay for it! Some people are dreaming that Auckland house price will fall, but it won't. Dreams are free! To many speculators here, they don't play game, other people make money and they regret! Not only they dream for Auckland house prices to fall they want the entire market to crash and the so called bubble to burst! A bunch of sour-grape non-Aucklanders really as they've missed out on the capital gain I'd say. maybe you catch up with what is happening in the financial world, there is huge deleveraging going on as people unwind from shares and head for the safety of bonds and gold, why because they can see a huge debt mountain under the floor boards that RB's all around the world encouraged and are now looking at how to deal with. I dont think "investors" saw the debt mountain as bad, in fact good, more like an opportunity to profit as long as the growth was their to support it and the RBs encouraged it. What we see now I think is the major thought that we are heading into another global recession GFC mk2? (or is it mk3?) and without the growth the debt cannot be serviced. Going to be interesting to see over the next few weeks if this trickle for the exits just takes off under its own steam and becomes a flood. Asia could lead the stampede? "Some people are dreaming that Auckland house price will fall, but it won't." I thought they were? I thought they were too! The last thing we get in all this debate, and not just here, is solid data. The best data I am told is the REINZ stratified index. Unfortunately they no longer make it available for free and funnily enough, the press don't quote form it even though they have access to it. So the REINZ stratified index dropped 6% from Oct-Dec. That's not a lot but it's steady falls over three months, Barfoots numbers for January suggest the falls will continue. We also ignore the simple fact that investors make up 40-50% of the market. When they disappear, that reduces demand and prices will (eventually) meet the new market. If you turn housing into a global investment asset class then expect it to behave like all financial markets. Housing is not a religion or a belief system (though if you read the Herald and listen to radio ads you could be mistaken). The data seems clear, it may be a temporary blip, but you can also feel it on the ground. Go to an open home. It's pretty quiet. I don't think this is a seasonal blip. And as for the hope that the Chinese will return once they get their head around the new paperwork for foreign investors, well I don't think it's about managing paperwork. China has clamped down on outflows (look at Macau Casino's VIP junkets - collapsing as are casino share prices as a result). It is harder to get money out of China and I read that it is not in China's interest to revert back to how things were. Also, the real fear is registering for IRD which NZ Govt will happily pass back to Chinese Govt. The worm has turned. Regardless of supply issues and all the other excuses for house prices rising, the main driver is the sheer volume of investors and speculators. Rents don't rise at the same rate as house prices which undermines the supply argument somewhat and in cities and towns in NZ and Aus it is becoming a renters market as a glut of apartments and rentals come on stream. With all the turmoil, there seem to be only two or three asset bubbles left and these are also at risk of popping. Equities looks like it is well underway, bonds are volatile and mental, housing is starting to slip and not just in Auckland. I just think it is irresponsible to encourage people into property investment at the moment. It's not a buying opportunity (yet) and I think it has a way to go. Sit tight. Yes they were in your dream...wake up!! Wow - finally the troll gets a like. I have seen it all now. Look who is trolling now. Can you please stop attacking me and move on? Thank you. To all you property bulls out there ..... I have said it before and will say it again, the Auckland property market for investors, is now losing them money, as if there are no capital gains at all or prices decrease even slightly, where is the "gain" on your investment ? ......its just an illusion in your mind, supported by the MSM, especially the NZ Herald spruiking with another article, how "fabulously" wealthy you can get from property or that it will keep going up forever. No serious falls in Auckland, too many immigrants. As long as people have their job then the houses for sale will simply dry up if it starts to move negative, I mean whats the point in selling ? you have to live somewhere and why sell and then rent, thats just crazy, once your out of the market its hard to get back in and you have no control over the rising rent and can get booted out at short notice. you are assuming that the majority of auckland is owner occupier, its now around the 50% mark so there are a lot of investment houses where the debt need to be serviced. Auckland will tank. 40% of the market are investors and they are not going to accept a 2.5% yield when capital gain sentiment changes which we are seeing right now. It is costing these investors money. When they start offloading these sour investments it will be felt first in the South and the West I predict a 15-20% drop which brings yield back into acceptable levels. I would be very concerned if I were geared up on Auckland property right now. I was informed by the REINZ this morning that they are hoping to get the January figures out today. One would have thought it was just a flick of the switch and it was all done. In reality I believe their reports are put together by a PR firm like many other corporates. I can only presume when I was told they "hoped" it would be available today they really meant the report was being given a really good polish and they wondered whether that process would be finished.today. Interesting times. I think they will spend more time polishing as each month goes by. There will be all kinds of excuses and theories why sentiment has changed in Auckland. yes ex agent. The Spin used to be "Prices are rising, time to buy. Move quick." Will it now become "Prices are plunging, time to buy. Move quick" ?